Sorry to disturb you on a Sunday Evening ! I need to share with you something which is close to my heart. At present I am building my dream house at Saltlake City, Kolkata. The civil work has just started and my aim is to move into my New House by Diwali 2016. I truly believe in this quote by Zig Zaglar " You will get all you want in life if you help enough other people get what they want "
I received this HEART TOUCHING EMAIL from Mr. Pandurang Korade, I urge you to read each bit of it. ** Click here to Enlarge this Heart Touching Letter. 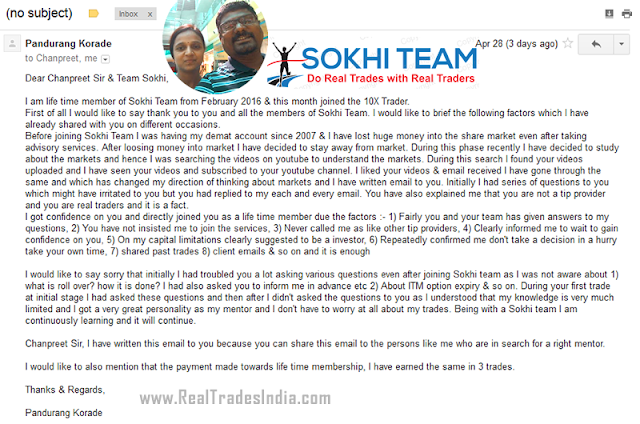 [ Dear Chanpreet Sir & Team Sokhi, I am life time member of Sokhi Team from February 2016 & this month joined the 10X Trader. First of all I would like to say thank you to you and all the members of Sokhi Team. I would like to brief the following factors which I have already shared with you on different occasions. Before joining Sokhi Team I was having my demat account since 2007 & I have lost huge money into the share market even after taking advisory services. After loosing money into market I have decided to stay away from market. During this phase recently I have decided to study about the markets and hence I was searching the videos on youtube to understand the markets. During this search I found your videos uploaded and I have seen your videos and subscribed to your youtube channel. I liked your videos & email received I have gone through the same and which has changed my direction of thinking about markets and I have written email to you. Initially I had series of questions to you which might have irritated to you but you had replied to my each and every email. You have also explained me that you are not a tip provider and you are real traders and it is a fact. I would like to say sorry that initially I had troubled you a lot asking various questions even after joining Sokhi team as I was not aware about 1) what is roll over? how it is done? I had also asked you to inform me in advance etc 2) About ITM option expiry & so on. During your first trade at initial stage I had asked these questions and then after I didn't asked the questions to you as I understood that my knowledge is very much limited and I got a very great personality as my mentor and I don't have to worry at all about my trades. Being with a Sokhi team I am continuously learning and it will continue. Chanpreet Sir, I have written this email to you because you can share this email to the persons like me who are in search for a right mentor.